Keita Bates-Diop was pick number forty eight for the Minnesota Timber Wolves in the recent 2018 NBA Draft, his name many are already familiar. Bates- Diop's place on the board into the second round of picks was unexpected because he has already demonstrated his skills as part of the Big Ten. With the experience that he has in college, he is expected to be a strong asset to the team. Tom Thibodeau, Minnesota head coach, expressed surprise at him remaining after the first round of picks in the Draft. He attributes his late selection to the high number of skilled players from which to choose. Thibodeau stated they picked him due to his performance during a workout and his past year at Ohio State. 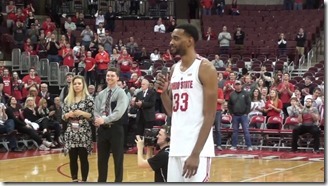 Bates-Diop's title of the Big Ten Player of the Year with the Buckeyes for 2017-18 was well earned. At 6'7" with a 7'3" fingertip to fingertip stretch, he averaged 19.8 points and 8.7 rebounds a game. Odds are he will play backup to Andrew Wiggins, but with a little work, he may be able to play the four, also. His range of skills ranges from his ability to pose a lob threat on offense, to using that impressive wingspan to block passes and switch between defenders, to extraordinary skills as a wing rebounder. As a major offensive player for OSU, his form when shooting shows promise. With effort, he can up his current percentage of 35.9 from three point range. In all, his remarkable adaptability makes him an excellent choice for the NBA. Thibodeau and the staff of the Timberwolves are pleased with Bates-Diop as their pick for the upcoming season. He has a strong determination to grow as a player. With some strength building and work on his shooting skills, he promises to be a player to watch.